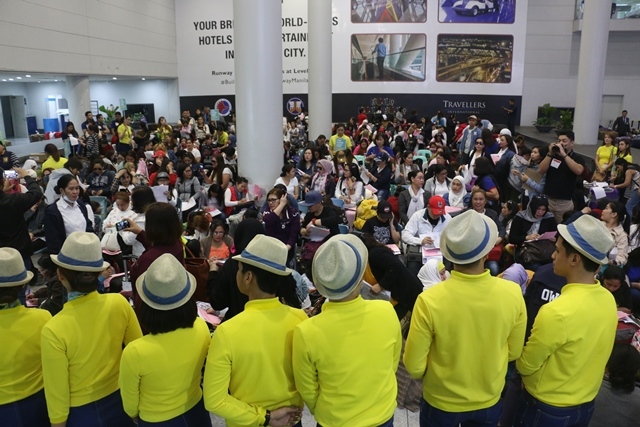 Aviation Updates Philippines - Leading Philippine carrier Cebu Pacific (PSE: CEB) provided airlift support for 396 Overseas Filipino Workers (OFWs) who were repatriated from Kuwait. This is the largest group of OFWs flown on a single flight from Kuwait by any airline. DEPLOYMENT BAN. Cebu Pacific Air granted the request of Philippine President Rodrigo Roa Duterte to help fly home OFWs from Kuwait after it executed a deployment ban. Photo by Cebu Pacific Air. Cebu Pacific flight 5J 021 departed the Kuwait International Airport at 1228am (Manila time; 7:29pm in Kuwait, Tuesday, February 20); and landed at the Ninoy Aquino International Airport in Manila past 9:00am today (Wednesday, February 21). In command of the humanitarian flight was Capt Mark Semon, assisted by First Officer Mark Leoven Meliton. A ten-person cabin crew was deployed to assist the OFWs during the flight, led by Lead Cabin Crew Carmencita Pimentel. Cebu Pacific mounted a special charter flight to airlift the OFWs back to the Philippines, deploying an Airbus A330 aircraft—the largest in its fleet—to allow Philippine embassy officials in Kuwait to accommodate more OFWs. The OFWs aboard Cebu Pacific Flight 5J 021 were also provided free baggage allowance, as well as hot meals for dinner and breakfast, bottled water and coffee, for the duration of the 9 ½ hour flight. CEB has previously announced that it would shoulder the cost of the entire charter flight, offering the airlift for free, in response to the call for assistance by the government to repatriate Filipino workers in Kuwait. Special arrangements were made with the Kuwaiti authorities since Cebu Pacific does not have regular commercial air service between Manila and Kuwait. Cebu Air Inc. is the largest carrier in the Philippine air transportation industry, offering its low-cost services to more destinations and routes with higher flight frequency within the Philippines than any other airline. CEB currently offers flights to 37 domestic and 25 international destinations, operating an extensive network across Asia, Australia, the Middle East, and the US. Its 60-strong fleet—one of the youngest in the world— is comprised of 36 Airbus A320, 8 Airbus A330, 8 ATR 72-500, and 8 ATR 72-600. Between 2017 and 2022, CEB expects delivery of seven more brand-new Airbus A321ceo, 32 Airbus A321neo, and eight ATR 72-600.